The fight for the Second Amendment is raging in Madison! In case you missed it, Senate Bill 169 — Constitutional Carry legislation — was given a full public hearing last week after the committee received so many of your calls and emails! After 9 hours of grueling testimony from both sides, including my own testimony on behalf of the Wisconsin Firearms Coalition, we are still awaiting a date for an ‘Executive Session’ where the committee will actually vote on the bill. Now that the first hearing for Constitutional Carry has taken place here in Wisconsin, this next big step could be days away. But already the bill is under full attack, as dozens of anti-gun lobbyists testified against it, spreading lies and distortions about what the bill would do. 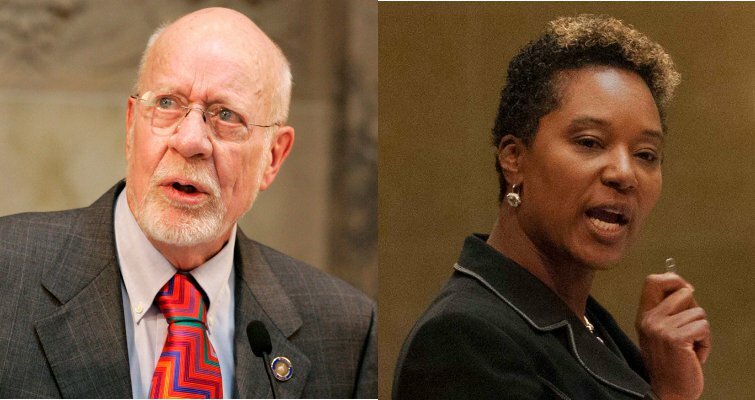 On top of that, notoriously anti-gun Senators Lena Taylor and Fred Risser have publicly stated that they are going to do everything in their power to kill this bill. The Executive Session is the time for them to do that. With Bloomberg funded front-groups like Moms Demand Action and Wisconsin Anti-Violence Effort all working overtime to stop this bill, I need you to help us fight back. Despite having ‘pro-gun’ majorities, gun owners should be very wary, as insiders are constantly telling me how scared the caucus is to advance this legislation. Of course, that makes no sense, as state after state have passed Constitutional Carry over the last couple of years and have only seen their legislative majorities increase! So, with the important public hearing out of the way, it is time to redouble our efforts and make sure the committee takes a vote on Senate Bill 169. The Judiciary and Public Safety Committee that held the hearing need to know you want the bill to pass with no weakening amendments. Please stand with us by contacting the committee members today and insist that they hold an Executive Session on the bill wherein they vote the bill through with no weakening amendments. Time is of the essence, please contact them immediately! I am afraid that if the committee only hears from the anti-gun media and Bloomberg-funded gun control groups, we will not obtain a vote on this bill. After you’ve contacted the committee, please consider becoming a member of the Wisconsin Firearms Coalition! As you can see, we are working on the ground day in and day out here in Madison to advance this legislation and to mobilize as many gun owners as possible to this fight. But we can’t do it without your help! So please consider joining the Wisconsin Firearms Coalition immediately. And if you were unable to attend the hearing last week, you can check out the testimony that we offered by clicking here. In case you missed it, our Constitutional Carry bill received its first public hearing last week in Madison! The Wisconsin Firearms Coalition was there, offering testimony in support of this crucial legislation. While we have had the first public hearing, the committee has yet to vote on this bill. So please contact them today, using the information provided above, and insist that they advance this legislation with no weakening amendments. Please also consider becoming a member of the Wisconsin Firearms Coalition, as we are fighting day in and day out trying to obtain a vote on this legislation! And if you are unable to attend the hearing, you can see the testimony we offered by clicking here. Constitutional Carry Has First Hearing In Madison! “Constitutional Carry” has become a phrase that garners a pretty emotional response, no matter who you talk with. The axiom refers to Senate Bill 169 (SB 169), a proposed bill that would remove requirements of both a permit and firearms training in order to carry a concealed firearm. Taking things a step further, school districts would be tasked with deciding if guns will be permitted on school grounds, because the bill also creates a new permit that allows gun owners to carry concealed guns on school property. In a recent Senate Judiciary Committee meeting, I and my colleagues listened to scores of people testify, both in favor and against the proposal. It’s difficult to have the discussion and not be reminded of the Weston High School, Washington High School, and Wauwatosa West High School shootings, right here in Wisconsin as well as the national incidents of school shootings. Those for and against, argue the impact, either positive or negative that introducing guns into a school environment can make. In response to the many concerns raised around firearms and gun safety over the years, I have put together a gun safety and accountability package aimed at making Wisconsin a safer place for everyone. The package includes proposed legislation that would improve standards for concealed carry by specifying that applicants must participate in at least eight hours of training; a “no fly, no buy” policy that prohibits anyone under suspicion of terrorist activity from purchasing a gun; micro-stamping laws so that we can link bullets found at crime scenes to the weapon that fired them, and requiring that concealed carry applicants have proof of general liability insurance of at least $800,000 to pay for any injury, death, or property damage that may arise from the gun holder’s careless use of the weapon. This is the lefts response to SB 169! DO NOT LET THE TRATORS TO THE CONSTITUTION WIN!!! PLEASE SHARE!!! !